Based on reviews from 1,364 users. Learn how our rankings work or see our guide to Under Armour sneakers. Updated Apr 2019. While the Under Armour is slowly conquering the basketball domain, the brand still needs a lot of catching up to do in the lifestyle world. Currently, Under Armour is working double time to get on the same level as Adidas and Nike in the casual pitch by collaborating with various artists, unveiling groundbreaking technologies, and launching a few hot trends. Under Armour was founded by Kevin Plank in 1996 in Maryland USA, as a result of his annoyance at the endless changing of sweat-drenched, heavy, and uncomfortable t-shirts from football training. He first concentrated in offering a shirt with moisture-wicking fiber and expanded into footwear with high-performance features. Under Armour has launched various footwear for a variety of purposes. Below are some of the most notable Under Armour Shoes by category. While they were considered underdog several years ago, Under Armour sneakers are slowly gaining popularity in the lifestyle world by introducing attractive models with groundbreaking technologies that will keep the feet cozy while looking on-trend on the city pavements. Some of the Under Armour sneakers can be classified as low-top, mid-top, and high-top. This slip-on UA Encounter II sneaker was designed to function as recovery footwear of athletes after their intense activities. It has stretchable upper for easy on and off that suits athletes who want to recuperate after intense games. These Under Armour sneakers feature a stylish design that suits on-the-go people. The UA Charged 24/7 Low sneakers have striking aesthetics with durable construction that will last a long time. The 4th iteration of the Street Encounter stayed authentic to the original silhoutte by offering flexible lacing system for easy on and off but revamped with sleeker and modernized look with an all-white sole. This iteration stayed true to its name, giving its wearers voguish kick for every day, all day use. These Under Armour sneakers have been designed to provide comfort and structure for wearers on the go to maximize the energy return for the smooth and consistent ride. This follow-up silhouette of the UA Street Encounter II displays Baltiflage pattern on its stretchy canvas upper. This sneaker is used as recovery footwear of athletes after intense lacrosse game. While these UA Elite Encounter IV sneakers were designed initially as men's surf slide footwear, these easily crossed the lifestyle scene for its charming appeal and comfort apt for the laidback weekend. Included in the appealing iterations of Under Armour sneakers, the speckled midsole of this Slingflex model provides a cushy ride, well-ventilated stride, ample compression, and few robust elements. This men-exclusive iteration displays canvas upper with printed inner lining for added contrast. Just like the other Under Armour sneakers, this model boasts its ultra cozy ride, lightness, versatility and easy on and off features. The Under Armour RailFit used the sliding hardware concept used in bags and backpacks to deliver one of a kind securing system. Some tagged it as one of the smartest marketing tools ever launched in the sneakers domain. The brand flaunted its Charged Cushioning System in these Under Armour sneakers and showcased sporty yet casual vibe with its round-toe profile. The brand utilized mesh upper with synthetic overlays and reflective elements apt for the casual ensembles. As part of the Under Armour sneakers, the brand unveiled the Street Encounter IV Mid that displays the boomerang accent on the side with speckled midsoles or color-contrasted band around the midsole. These Under Armour sneakers have the monochromatic canvas upper with the modernized and appealing look and secured fit apt for daily use. The lightweight Street Encounter Mids fit users who are always on the go. This UA Charged 24/7 Mid was launched in 2016 which boasts its comfortable fit ankle collar and adjustable cord fastening system. It is lightweight and breathable and has smart features that can match with almost any outfit. These Under Armour sneakers with two-toned mesh upper brag its maximized ventilation and lightness fitting for the all-day strutting. It has suede ankle collar with Bemis tape for enhanced next-to-skin support and comfort. The brand used the Charged Cushioning System that absorbs the impact effectively. These Under Armour sneakers have premium suede upper detailed with laser-cut elements. The brand inserted comfortable features that will make this model suitable for the everyday use. The midfoot strap of the Under Armour Forge 1 Mid Camo makes this pair appealing for the buyers. This feature delivers stability and a snug fit to provide comfort and support. This Under Armour sneaker has gum rubber outsole for added design and enhance the durability. From the football fields to the city pavements, the Jungle Rat from Under Armour has started dominating the terrains by introducing tactical boots. 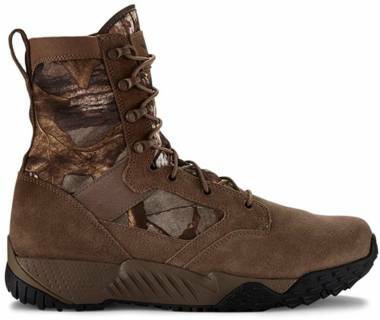 One of it is the Jungle Rat that displays high-top profile with lightweight, durable, and high-performance materials. This latest model of the Under Armour sneakers has fused the ample amount of sport and style by offering modern yet minimalist sneakerboot. This hybrid iteration has no huge UA logo which makes it more versatile that can match endless attire. This kick is made of dark blue leather upper with a high-top collar that is usually seen on luxurious fashion brands such as Lanvin and Balenciaga. With a vision of overtaking the Nike and Adidas in the leading footwear provider in the hard courts, Under Armour has launched various basketball footwear with basketball superstar Stephen Curry as their lead man. In 2010, during the launching of Micro-G technology, the brand unveiled the UA basketball line just in time for the 2010-2011 NBA Season. Some of the popular Under Armour basketball shoes are Under Armour Curry 3, Under Armour Curry 2.5, Under Armour 3Zero, Under Armour Clutchfit Drive 3, and Under Armour Longshot. Under Armour Running Shoes have secured their spot in the running footwear category in the market. The brand set a challenge on the forerunning brands in the running arena by delivering high-performance kicks that suit the tracks and trails, professional and nonpro runners, for men, women, and children. Few of the prominent Under Armour Running shoes are Under Armour Charged Bandit 3, Under Armour Speedform SlingrideTRI, Under Armour Speedform Apollo 2, Under Armour Speed Swift 2, and Under Armour Micro G Speed Swift 2. Under Armour launched their training shoes with a purpose of protecting its wearers for various fitness activities. These kicks were designed to suit various fitness classes, weightlifting, or any other actions done in health clubs. Under this category, footwear provides more cushioning and different levels of stability to safeguard the ankle and the feet. Several notable Under Armour Training shoes are Under Armour Commit, Under Armour C1N Trainer, Under Armour Limitless 3.0, Under Armour Ultimate Turf, and the Under Armour Charged Legend. While considered newbie in the football boot race, that did not stop the 12-year old company to create a solid name in the field. Obtaining a 31% sales in 2012 in their impressive lineup of kicks, football shoes from the Under Armour is considered a solid choice in the market. Few of the most remarkable UA Football shoes are Under Armour ClutchFit Force 2.0 Firm Ground, Under Armour ClutchFit Force 3.0 Firm Ground, Under Armour SpeedForm CRM LTHR, Under Armour Spotlight BL Firm Ground, and Under Armour Spotlight Firm Ground. This cushioning system of Under Armour sneakers provides responsiveness and bouncy feel. It is considered thinner by 30% compared to other cushioning systems. Thus it reduces the overall shoe weight and allows the foot to be closer to the ground. By this, the wearer can feel what’s under the shoes and improves the ability to alter direction swiftly. The Micro G technology also has a high rebound foam that provides extra lift for enhanced return. Few examples of Under Armour sneakers with this kind of technology are the Under Armour Slingflex Rise and the Under Armour Threadborne Slingflex. This technology inserted in some of the Under Armour sneakers absorbs the impact effectively and transforms it into responsive bits and pieces. Thus, providing every stride with explosive power. As energy is given, the power is efficiently returned. 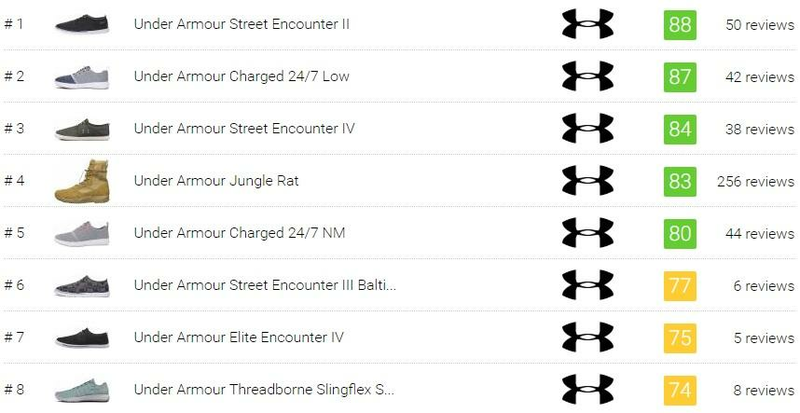 Few samples of Under Armour sneakers with this technology are the Under Armour ICON Charged 24/7, Under Armour Charged Covert Knit, and the Under Armour Charged 24/7 Low. This technology is not only found in Under Armour sneakers but also incorporated in several performance shoes. This innovation perfectly hugs the foot with its flawlessly molded heel cup. This element gives a smooth extension of the foot by its ultrasonic seams giving next-to-skin support and comfort. The brand added the external TPU heel counter that delivers reliable stability and lock-in support. The Under Armour Speedform Slingshot 2 is one of the Under Armour sneakers with this kind of technology. This breakthrough Under Armour technology is made of lightweight threads delicately woven together to provide advanced ultra-soft and stretchable fabric. This design allows maximized range of motion of the foot with anti-odor technology keeping the feet fresh all day. One of the impressive Under Armour sneakers with this kind of technology is the Under Armour Threadborne Slingwrap. In 2018, Under Armour launched its latest cushioning technology called the HOVR. This technology provides better cushioning and energy return through its Energy Web that is made of mesh fabric. This design wraps the cushioning while delivering strong responsiveness which results in better performance and less fatigue feeling of its wearers. There are numbers of Under Armour sneakers currently hold this technology, and one of them is the Under Armour HOVR Phantom Heather. Under Armour and Hollywood superstar Dwayne Johnson first introduced its first-ever collaboration called the "SuperVent Project Rock Collection" in 2016. This line is offered in both genders' sizing and comprises of shirts, tank tops, legging, shorts, and footwear. The Rock tagged his first ever Under Armour sneaker as the Under Armour Project Rock Delta that features well-ventilated, black mesh upper with Charged Cushioning System for a comfy ride with every stride. This model has yellow details all-over to add contrast and style and has been hailed as one of the fastest selling Under Armour sneakers of 2016. Following the success of his first collaborative collection, Johnson launched another series with few Under Armour sneakers in 2017 to pay homage to the US military people. The USDNA collection features the Delta Rock silhouette in different colorways that represents the brave men and women from the military. On the Memorial Day of 2018, Johnson unveiled his first ever signature kick dubbed as the Under Armour Project Rock 1. This all-around footwear displays synthetic upper with bootie-construction, cushioned with the Micro-G technology. Adding Johnson's signature element is the Brahma Bull logo on the heel. Under Armour and A$AP Rocky announced their collaboration in September 2017, a first in the history of UA teaming up with a musician/entertainer, and a first in the world of hip-hop. This partnership is set to release trendy merchandises with series of philanthropic community-based programs. After countless speculations, the brand finally unveiled its collaborative Under Armour sneakers in the middle of 2018. It showcases an all-black hue with a chunky tongue that reads "Designed by Yours Truly in Association with Under Armour." It also displays a large, unique lacing system taken a cue from the Osiris D3. This kick also flaunts a striking segmented sole unit inserted with cushioning pods. Teaming up with Microsoft, Under Armour dropped the Under Armour Curry 4 simultaneously with the Xbox One X. This partnership introduced a VIP kit that holds the unique Curry 4 "More Power" in matte black and metallic green colorway that depicts the electric circuit system. Included in the VIP kit are the Xbox One X console, with the V-MODA Crossfade 2 Wireless Headphones, a gaming microphone called Boompro, elite controllers from the Xbox One Elite, and much more. Paying homage to Tom Brady, Under Armour partnered with Concepts to conceived a limited edition of the Under Armour ArchiTech Futurist. This model flaunts the UA ArchiTech Futurist's compression lacing system and 3D printed heel that looks like a lattice network. To make it more charming, the brand dressed this innovative silhouette in unique Patriots colorway - dark blue all over the body with hints of red and white on its signature details. This model brags its UA Speedform upper for snug fit reinforced with midfoot sleeve strap extended up to the ankle for support and dynamic fit. UnderArmour sneakers were built with the conventional sizing factors; thus, it is advised to order what you usually purchase. The brand recommended measuring the true foot by tracing your entire foot on a piece of paper, then measure from toe to heel. The measurement in centimeter has corresponding standard sizes of the UnderArmour charted here https://www.underarmour.com/en-us/size-charts#mens-shoes. It is advised to purchase a size up if the measurement in centimeter lies between the chart numbers. Ladies can also enjoy the men specific UnderArmour sneakers by purchasing 1.5 sizes down their regular shoe size. This size allowance is a rough conversion; thus, there is still a chance that the pair might not perfectly fit you. What is the price range of Under Armour sneakers? Under Armour sneakers are presented from $25 to $300 depending on the technology, materials, and collaborations. Notwithstanding its technical specs, the brand has generally stayed on the budget-friendly price range that can rival the much more expensive brands. The Under Armour sneakers found in the $25-$50 range are shoes mostly for the kids and uses canvas, mesh, or nylon upper with simple cushioning system and technology. Few examples of Under Armour sneakers under this range are Pre-school Under Armour Infinity, and the Grade School UA Charged 24/7 2.0 Elevated. Meanwhile, the $50-$100 price range of Under Armour sneakers is predominantly composed of more high-quality materials with more modern technologies such as the Threadborne and the Charged Cushioning. Few examples of Under Armour sneakers found in this price range are the Under Armour Charged 24/7 Low Explosive, Under Armour Drift 2, Under Armour Charged Legend Stripe, Under Armour Threadborne Shift, and Under Armour Slingflex Rise. Also, the $100-$200 range consists of mostly the Under Armour sneakers with the latest technologies dressed with more expensive materials. Two examples of Under Armour sneakers found in this price range are Under Armour HOVR Phantom Heather and UA ICON Railfit. To add, few collaborations of Under Armour sneakers are priced from $150-$300. The Curry 4 "More Power" is retailed at $150 while the partnership with A$AP Rocky is sold at $300. What does the Under Armour slogan mean? In the very first ad of the Under Armour in 2003, Eric "Big E" Ogbogu, a former NFL player, shouted, "We must protect this house!" This line transformed into "I will" as an emphasis that sets a challenge beyond the team. This slogan encourages the each of its wearers to become faster and stronger and merely turn into all-around better athletes. How did Under Armour come up with their logo? The simple logo of the Under Armour is so easy to recognize, and people can effortlessly relate the logo to the speed, strength, and athleticism. This design was derived from the combination of the first letters of the company’s name. The U and A are fused forming a crisp and unique crisscross look which adds aesthetical charm. People credited the success of the Under Armour, aside from the quality and innovative technologies, on the impact of their straightforward logo on the consumers. Also, the custom typeface of the 'Under Armour' was designed specifically for the brand that blended the smooth edges and sharp points to convey the points of toughness and fierceness while staying comfortable. How Nike lost Stephen Curry to Under Armour? Back in 2013, Curry was under the hood of Nike. During that time, Nike was so busy with the fast-rising star Irving as their next superstar endorser and somehow neglected Curry. Nike failed to see the potentials of Curry to sell their shoes and turned complacent towards Curry. By the end of 2013, Curry’s contract with Nike is about to end, but Nike failed to match the offer of the other competing brands to Curry by less than $4million. Stephen Curry, the superstar point guard of Warriors, has been with the Under Armour since 2013. For UA, Curry has the three essential traits that make him suitable for the company – young, underdog, next big thing. Unlike most of Nike’s endorsers, Curry's appeal is like any other ordinary person playing in the streets - no bulky muscle, no studs with a taut haircut. Some say it was hard for Nike to swallow the thought that they let a potential superstar slip away. The upswing of Curry’s popularity was like a lightning bolt. Just like that, Steph Curry was on the scene and transformed into a perceptible athlete. Nike and even the people closest to Curry were unsuccessful in seeing the possibility that fans would line up to experience a sight of Curry. When the Golden State Warriors won the NBA Championship in 2015 and Curry took home the MVP title, the sales of The Curry One sneakers skyrocketed to 754% which was way higher than the expected sales. Because of that, the executives are planning to build $1billion basketball brand under Curry’s name further. Kevin Plank, the football team captain of Maryland University, thought of engineering shirts for the athletes that will allow them to change their shirts less often. That idea in 1996 changed the athletic apparel forever. He formed a company and named it Under Armour. Plank initially wanted “Body Armor” as the name for his apparel, but his brother misheard him saying “Under Armor.” That stuck in his mind and used the British spelling instead. Plank conducted extensive research about the synthetic fabric and created the first moisture-wicking performance fiber, the Under Armour Heat Gear and named it #0037. This technology keeps the wearer cool, dry and light in sweltering weather conditions. He first worked in his grandmother’s basement in Washington and sold his innovative products out of his car trunk. And by the end of its first year’s release, Plank was able to generate $17,000 in sales. A year after, the Under Armour launched fabric that will keep athletes warm, dry, and light in cold conditions and named it the Cold Gear. Meanwhile, the All Season Gear line keeps the athletes comfortable between the extreme weather conditions. By the end of 1998, barely two years after the company was marketed, Under Armour was able to outgrow grandmother’s basement and relocated to their headquarters in Baltimore. The company is involved in a few philanthropic activities with a goal of inspiring everyone to improve their performance in the communities that we all call "Home." This platform aims to raise awareness about breast health through innovations and celebrates all those who stay healthy through fitness. The company partnered with Johns Hopkins Medicine with a $10-million commitment of building an Under Armour Breast Health Innovation Center. This movement aims to boost the physical and mental wellness of the retired and active military men and women. The brand currently has partnerships with several organizations that support the men and women who dedicated themselves in protecting the public. This commitment to the youth is focused in capitalizing on several sports programs that will teach kids life skills which will equip them to succeed on and off the field. The brand is dedicated to providing young person equal chances to participate in significant sports experience. This program is directed at providing a strong network of engaged teammates and allows them to give back to their communities through the act of volunteerism. This way, the teammate will set a good example in their communities through their actions, unfailing dedication, and passion. Plank initially wanted to name his brand as "Heart," as in "like wearing your heart on your sleeve," but the trademark application was rejected. The same thing happened to his application for the "Body Armor" trademark request. Plank decided to use the British spelling of Armor as he wanted to get a cool toll-free phone number. He thought that the phone number 888-4RMOUR is much more convincing than the 888-44RMOR. In 1999, two movies gave the Under Armour significant exposure. In the "Any Given Sunday" movie, the entire football team wore the Under Armour apparel. It was also the first product placement of the company that exhibits their jockstrap. Also in "The Replacement" movie, several significant scenes and Keanu Reeves' quarterback character wore the Under Armour apparel in the football field. Aside from apparel and footwear, Under Armour already ventured on health-related apps, such as MapMyFitness, Endomondo, and MyFitnessPal. The company has spent $710 million in acquiring several apps and recently introduced its fitness app named Record. Behind the Nike, Under Armour has beaten the Adidas in the sports-apparel arena in the US. Several analysts have predicted that by 2030, Under Armour will be the third largest sportswear brand in the entire globe. The company reached its first billion-dollar revenue in 2010, fourteen years after it was introduced to the market. In 2000, Plank boldly exhausted the company's bank account, with all his employees' consent to go without pay for few weeks, so the Under Armour could purchase a half-page ad in the ESPN The Magazine. In 2013, the net revenue growth of the Under Armour was 27% while the Nike has 8%. In 2014, the brand unveiled their largest marketing campaign "I Will What I Want" that features women's wear and led by various athletes such as skier Lindsey Vonn, soccer player Kelley O'Hara, and ballet theater soloist Misty Copeland. This campaign expressed that women do not need any permission in making their aspirations in life come true. Since Plank is known to love holding on to many things, in fact, he still holds the receipt to the company's first ever sale; the company has an archive team dedicated solely to preserving and documenting the history and significant events in the company. The Under Armour athletic brand is now being endorsed by some top athletes such as football player Tom Brady, golfer Jordan Spieth, pitcher Clayton Kershaw, skier Lindsay Vonn, quarterback Cam Newton, swimmer Michael Phelps, and many more.